for all parents in the us who suspect that their children are using drugs, a government-approved kit will soon be at their disposal. The kit called "Dr Brown's Home Drug Testing System" has recently been approved by the Food and Drug Administration (fda) for use. The nod came four months after the fda and the Clinton administration faced flak from the Congress over the former's earlier attempts to restrict the distribution of a similar product called Parent Alert. The new kit is supposed to treat urine effectively in order to help detect the presence of drugs like marijuana, amphetamines, cocaine, heroine, codeine and morphine. Each sample has an identification number to enable users to remain anonymous and obtain the required information confidentially. The new package is not a home diagnostic kit, but a home collection kit whereby samples would be collected and sent to laboratories. 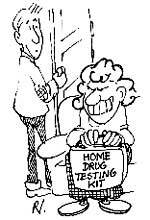 The samples will be screened for drugs and confirmation tests to minimise errors will also be performed. Following this, the results would be passed on to users by telephonic messages.